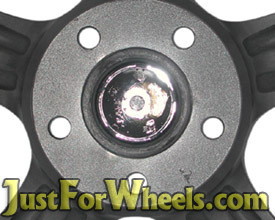 Do you have vibration issues on your aftermarket wheels? Have you tried to balance and rebalance your wheels? 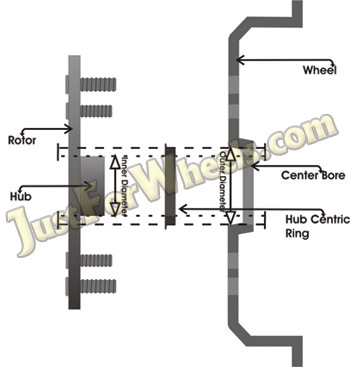 Hub centric rings can help to eliminate this vibration. Hub centric rings are designed to fill in the gap between the hub of the car and the center bore of the wheel. Most wheel manufacturers design their wheels with a centerbore large enough to fit on most cars. These wheels have a larger bore diameter than the hubs of the vehicles they are made to fit onto, as a result they are not hubcentric to your vehicle which causes vibration. Made from durable heat resistant materials hub centric rings fill this gap and ensure the Wheel is installed perfectly centered on the vehicles hub which helps to eliminate the vibration. Hub rings can also be used when mounting stock wheels from one make and model vehicle onto a different make and model vehicle which has the same bolt pattern, but a smaller hub. 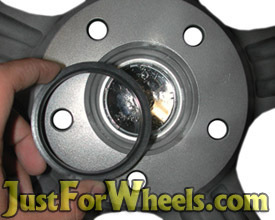 This again creates a gap between the centerbore and the hub of the vehicle, resulting in wheels that are not mounted hubcentricly unless hub rings are used. What size Hub Centric Rings do I need? Using our Hub Centric Ring Application Search select your cars make, model, and year along with your wheel's manufacturer,then our database will decide the correct centering rings for your application, and if we have the correct size hub ring in stock, it will show up in our search results. If your wheel manufacturer is not listed we may still have a hub centric ring for your application! email us at fitment@justforwheels.com with any information you may have on your wheels and we will do our best to determine fitment with the information you provided. Already know the size you need? Using our Hub Centric Ring Size Search input the inner and outer diameters of the hub rings you need and if we have a hub ring with those specification in stock, it will show up in our search results. If we do not have the size listed that you're looking for we may be able to custom make your rings! Please email us at custom@justforwheels.com with the inner and outer diameters you need and we will email you back with a quote to custom make your rings.